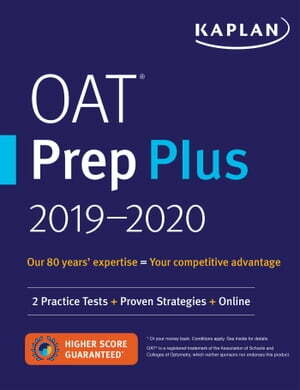 Collins Booksellers - OAT Prep Plus 2019-2020 by Kaplan Test Prep, 9781506235240. Buy this book online. Kaplan's OAT Prep Plus 2019-2020 provides the test-taking strategies, realistic practice, and expert guidance you need to get the OAT results you want. Our comprehensive updated subject review reflects recent changes to the blueprint of the exam, question types, and test interface. You'll get two full-length practice OATs and expert tips to help you face Test Day with confidence. The previous edition of this book was titled OAT 2017-2018 Strategies, Practice & Review.